Maxwell–Ampère's law An electric field together with its rate of change generates a magnetic field. Faraday's law The rate of change of a magnetic field generates an electric field. Gauss's law The assumption is that there are no free electric charges. Gauss's magnetic law There are no free magnetic charges. Maxwell–Ampère's law and Faraday's law can be combined into a second-order wave equation by taking the curl of one equation and substituting it into the other. In other words, the system formed by these two first-order equations represents electromagnetic waves. Beam splitters can split a beam of light, such as one with a 700-nm wavelength, into two. To create a beam splitter, one method is depositing a layer of metal between two prisms made of glass. Within the layer, the beam is attenuated slightly and then separates into two different paths. 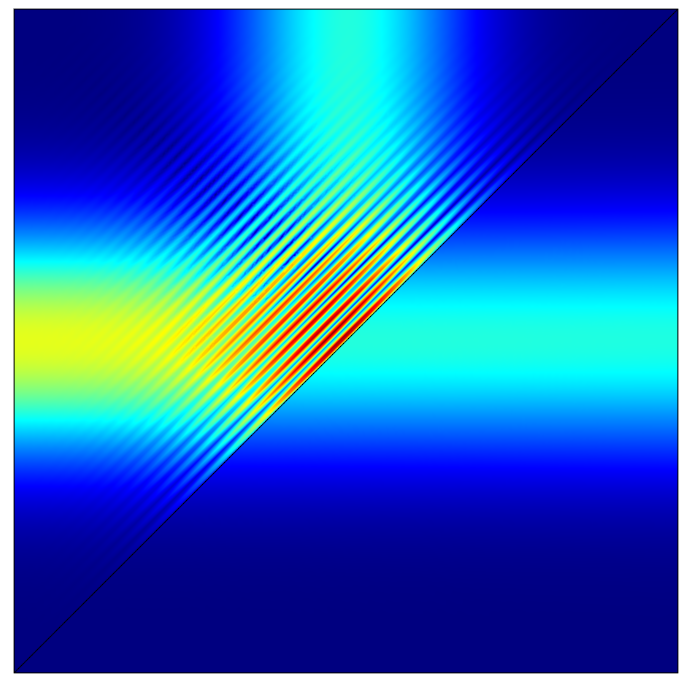 The image shows the magnitude of the electromagnetic wave, where red and blue are high and low values, respectively. With this formulation, we have assumed space-independent material properties. By instead deriving a wave equation from the magnetic vector potential, this restriction can be relaxed, as shown below. Here, is the magnetic flux through the closed contour C, while is the surface current density. The limiting process for deriving the boundary conditions corresponding to the surface integrals in Maxwell–Ampère's law and Faraday's law involves fluxes that run perpendicular to the limiting surface. The process's contribution is zero for a vanishing surface area, and because of this, the boundary conditions corresponding to Maxwell–Ampère's law and Faraday's law are identical to those of the static cases. A section of air surrounding a rectangular, perfectly conducting metallic plate subjected to an incident plane electromagnetic wave at 10 GHz. The plate is 1.5 by 1.5 by 1 mm. The electric and magnetic vector fields are represented by red and blue arrows, respectively. The electric field is polarized in the y direction. The -component of the field is visualized at a certain instance in time by color on two intersecting planes, where blue and red represent low and high field values, respectively. The field pattern near the plate is a result of the fact that the electric field tangential to the metallic plate is zero. Note that this formulation is for a time-independent material. For a time-dependent material, the permittivity cannot be taken outside of the time derivative. Note that the equation for is identical to that of due to the relationship . where is the speed of light in a vacuum and is the phase velocity of light in the medium. The refractive index can also be written as a function of the relative permittivity, , and permeability, , according to . where is a constant vector; is the wave vector; is the spatial coordinate; and is the time-independent, complex-valued phasor field. The condition that the wave is planar corresponds to for the phasor field , assuming an isotropic material. For a linear medium, the time-harmonic version of Faraday's law takes the form . so that Faraday's law for a plane wave becomes , or equivalently, . This is the plane wave equation, which is restricted to media with a homogeneous isotropic permeability, as explained below. If the medium has an anisotropic permeability, , then due to , we may have that and are not aligned. Thus, , , and are not necessarily mutually perpendicular. so that is guaranteed to be perpendicular to both and . Furthermore, since and , we have that is perpendicular to both and . However, if we allow the permittivity to be anisotropic, then and may not be aligned, as . This means that may not be perpendicular, or transverse, to . Misaligned and or misaligned and corresponds to the wave vector not being aligned with the Poynting vector, . Equivalently, the momentum flux is not aligned with the Poynting vector.